I like the petition by MDC Alliance unveiled at a party demonstration in Harare yesterday and presented to the parliament, Mnangagwa, SADC and African Union. I support the MDC Alliance and its President Nelson Chamisa but I am against two things; the ill-treatment of a senior member of the party and VP Mudzuri yesterday and few days ago, and the demand for a National Transitional Authority. I think Mudzuri deserve respect as a senior member and Vice President of the party. Mudzuri broke no MDC law in attending a parliamentary meeting at the state house. Mudzuri was simply discharging his duties assigned by the MDC in parliament. I believe Hwende and party must be disciplined for disrespecting the party vice president in public which resulted in Mudzuri ridiculed party supporters yesterday. Leaders must lead by example not to behave like high school boys. Hwende and party must immediately apologize to Mudzuri. Harbouring ambitions to contest the presidency alongside Chamisa at the coming congress is not a crime but a right to every party member. 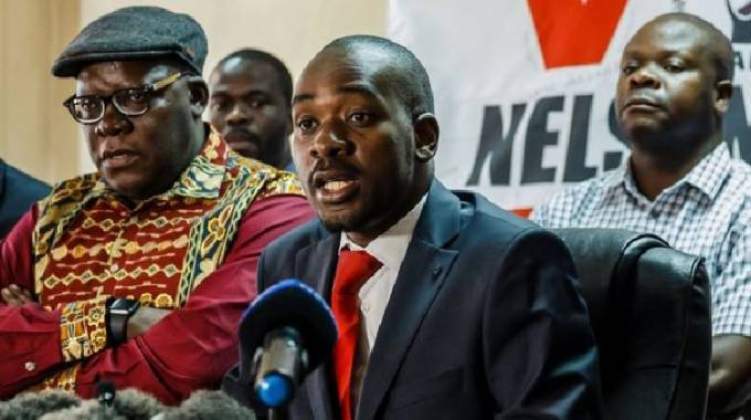 If Hwende and friends are of the view that Chamisa is the right candidate for the MDC presidency come next congress and that the majority of party members like him, why treat other leaders as villains a few months before congress? Mudzuri and Mwonzora deserve respect from all MDC members; they worked for this party for a long period of time.The two deserve honours not what they are getting now. I also disagree and oppose a demand by my party MDC Alliance for the so called National Transition Authority (NTA) for the simple reason that it is not provided for in the Zimbabwean Constitution. The NTA is unconstitutional. Our constitution was voted for in 2013 and last year Mnangagwa as both VP and Minister of Justice made the first amendment and MDC was heard condemning ED'S decision to amend the constitution .Its surprising today the same MDC is now pushing for a second amendment to the constitution for nothing but simply to create a post for Chamisa in government and probably to give Biti a ministerial post through the backdoor. Sensible Zimbabwean must not be carried away with this but must oppose this foolish NTA. The NTA will not succeed but is doomed to fail from the onset. There is no difference between the proposed NTA and the failed GNU of 2009-2013.The GNU failed to bring electoral reforms, media reforms, security sector reforms etc but today we are being told the NTA will be there to bring electoral reforms blah blah ..the same issues which necessitated the formation of the GNU IN 2009 but failed dismally.The GNU only succeeded to give Tsvangirai a mansion while Chamisa and Biti got Ministerial posts but nothing for poor MDC supporters. Why must we be made to believe this time around the NTA succeed? The GNU failed because parties were scheming against each but ZANU PF proved smarter than the MDC which resulted in its defeat in the 2013 elections. I know that you will tell me that 2013 elections were rigged, but Biti the current MDC Vice Charman clearly said Tsvangirai was defeated by Mugabe. Someone will argue that yes the NTA is not provided for in the constitution but we will amend the constitution.Is it noble to amend the constitution after each General Election? Do you think amending the constitution is the right solution to every electoral dispute? Who doesn't know that the idea of NTA started with Biti and Ibbo Mandaza? Biti's party started this idea but Tsvangirai and the MDC refused to buy this silly idea. Today Biti is admitted into the MDC party, we now see Chamisa campaigning for the same NTA which was rejected by Tsvangirai during his days. Where are we going? Chamisa and MDC now captured by Biti? Who is really calling the shots at the MDC Alliance party? I say no to the NTA because it is one of the undemocratic governments. Leaders of NTAs are not elected officials but imposed leaders by political elites. It is not a government of the people. Legitimacy of democratic governments derives from free and fair elections but NTA governments are not a result of elections but of negotiations therefore lacks legitimacy. We want a legitimate government of the people by the people and nothing less. Someone would say elections had failed to solve the Zimbabwean crises, but I will ask you again, did the GNU succeeded in solving the Zimbabwean crises? If yes then why are we calling for NTA today? The NTA is simply a ploy by some MDC officials to try to get Ministerial posts in the government but poor Zimbabweans who chant slogans day and night will remain poor and jobless. Progressive Zimbabweans will not support an unconstitutional NTA, I will subscribe to the idea if both the MDC and ZANU PF will not be part of the proposed NTA. The MDC and ZANU PF must not also be found at the negotiating table for the proposed NTA! I want to re-emphasise that I support the MDC and Chamisa but I am totally against the silly and stupid NTA. Why is it easy for Chamisa to call for an NTA and not for fresh elections if indeed he was rigged during the previous elections?